"I want to be involved in that moment of trying something new and falling in love with it." Vanessa is Junction Workshop’s newest instructor. She’ll be teaching the hot pipe mobile class, where students can design their own mobile using thin slices of wood they’ve bent themselves using a hot pipe and a propane torch (!). 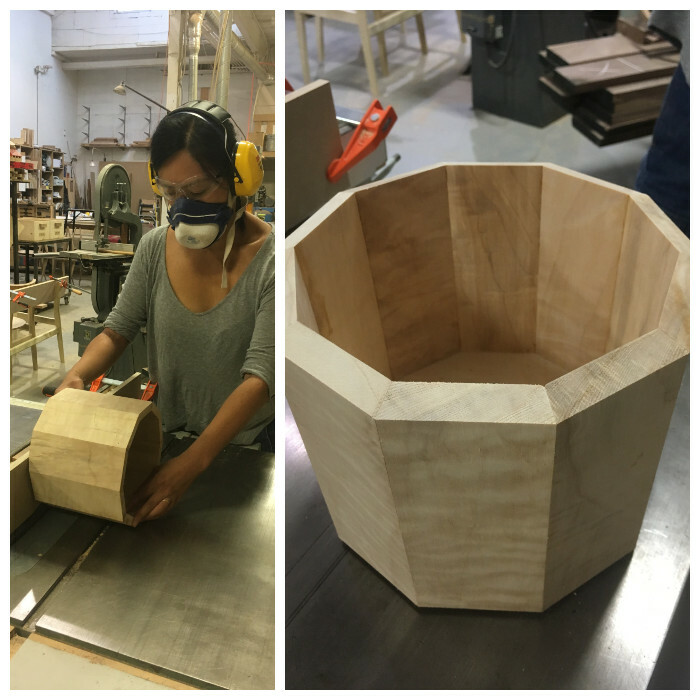 Before Vanessa decided to train to become a cabinet maker, she had never worked with wood before. It was 2010, she was bored of working a serving job and wanted to go back to school for something more hands on. Humber’s one-year cabinet making program appealed to her, it was only one year and she figured that even if she didn’t come out of it a full-fledged cabinet maker, she would at least be a much handier human. At Humber, she not only fell in love with wood, but with making in general and using tools. Wood was her gateway material, from there she got into metal and started welding, and then concrete and cement, sculpting, textiles, plasters, mosaics, macramé…the list goes on. Eight years later and Vanessa’s a bona fide furniture designer, woodworker, and maker. Working in the industry as a designer and fabricator for commissioned designs she has now gone back to school to do a Master’s of Design at OCAD. I spoke to Vanessa about what she loves about wood, her favourite piece, and what she would be if she wasn’t a designer/woodworker/everything maker. After working as a successful furniture designer, what made you decide to go back to school? I want to become an instructor and for that I need a master’s degree. I really enjoy teaching. I’ve taught classes before at the Living Arts Centre in Mississauga, I’ve taught workshops at OCAD, and it’s just something that I realized I want to continue doing. I really fell in love when I first started to make stuff and that whole process is just so incredibly satisfying and gratifying and magical. So, I want to be involved in that process for other people, for that moment of trying something new and falling in love with it. You’ve worked with a lot of materials, what’s your favourite? I really enjoy wood a lot. That’s where I started. Any physical material attracts me, but wood is just so special because trees are such magnificent beings. Wood can feel alive. Especially when you’re creating something, you spend a lot of time with the materials, with wood you can really feel a presence and understanding that you’re giving it a second life. What’s your favourite piece that you’ve made? I made a wardrobe [photo below] while I was studying furniture design at Sheridan. It was for our cabinet class and my inspiration was my grandma’s old steam trunk from the 1900s. I got this old vintage wall paper and I lined the inside of it, and I made the hardware for it myself. It was my first experience working with metal. There’s just something nice about the piece. It’s on casters and there’s a latch, and when you open it up there’s a nice reveal to it, a certain drama. It also just reminds me of my grandmother. One of the greatest things about Junction Workshop is that it brings together people who have very different jobs/careers. If you weren’t a woodworker what would you be? I would probably be a herbologist. When I was deciding what I wanted to get into and study again I was toying between herbology and woodworking. If I didn’t do the cabinet course I probably would have moved out of the city and into the forest and become a herbologist. I like the sense of magic that’s involved in it, just the idea that these plants can help heal us and we can cultivate them and the science of that. I still dabble a bit as much as I can, it’s harder living in the city. I make some tinctures but I never really delved into it 100%. It’s something that I’d like to get into again when I’m older and have more time. Christina with her cork planter. Christina Pupo is the new fearless leader of Junction Workshop (JW). Since taking over the reins from Heidi and Carey in September, it’s hard to imagine a better person to entrust with strengthening and growing our unique community. Christina works by day as a technician and instructor in the Faculty of Design at OCAD U, the rest of the time she leads JW, runs a side business selling cork planters, and attends craft schools where she learns how to work with all kinds of different materials. She’s also mom to Siri the geriatric pup and Butters the cat. Christina is a busy lady. While Christina’s a wood worker first, she’s bringing a broad skill-set to JW that includes ceramics, bronze casting, and cork explorations. I spoke to Christina about her decision to take over JW, where she sees it heading, and why she loves cork so much! What made you decide to join JW? This is something I’ve always wanted to do and I always admired how Heidi and Carey grew and ran JW. I’ve been going to these craft schools in the States, the Penland School of Craft in North Carolina and the Anderson Ranch Arts Center in Colorado, where you can take classes for a week or two on a variety of mediums, from bookmaking to ceramics and metal work. You end up spending day and night with a group of creative people in a studio making things. It’s like art camp for adults. I’ve always enjoyed and admired these craft schools, which is why being part of JW is great. My dream is to eventually have a property outside of the city with a variety of studios where we can host retreats. One of your favourite materials to work with is cork, why? It’s a really interesting material. Cork is rot resistant, a natural fire retardant, and water resistant, it’s used in so many things you would never think of like as a leather alternative in bags and in heat shields on spaceships. The way it’s harvested is also really fascinating. It’s the outer bark of the cork oak tree and most of it comes from Portugal. It takes 9 years to get to the right thickness for harvesting and there is a certain time of year when the humidity is right and you can just peel it right off the tree, it sounds like Velcro. Once harvested, they punch out all the wine bottle stoppers. Then the rest is mulched and turned into different products like sheet materials of different densities, fabrics, or flooring. All the leftovers from that are broken down and used again. That’s what’s so amazing about cork, there’s absolutely no waste. It’s sustainable and renewable. How did you get into wood working? I’ve always been creative and had a desire to take things apart and put them back together, or not... I always wanted to do something with my hands. When I was younger I would refurnish all my furniture and change it as much as my skills would allow. I just loved the idea of working with wood. It was something I wanted to learn because it was a skill I could really see myself using. So, when I stumbled across Sheridan College’s furniture program, I absolutely fell in love with it and applied. The program is great in that it’s so hands on, they get you on the table saw right away so you dive right in and start making things. I liked that everyone had really different backgrounds. There were a lot of mature students who had previous careers and I found that everyone was really focused and knew exactly what they wanted from the program. Why do you think there’s so much enthusiasm for JW’s classes? It gives people who are interested in getting into wood working a great starting point because you don’t have to enroll in school or buy a bunch of expensive equipment and machinery. Taking a class is great to get a sense of what it’s like and see if it’s really something you’re into. You’re not investing too much time or money and you get to learn from experienced and established wood workers. It’s also just something you can do for fun, you can take a class and proudly walk away with something you made. What do you think is a common misconception about wood working? That a career in wood working will make you a ton of money. People do it because they love it. A lot of people think it’s easy and you can build something fast, but it’s challenging and it’s time consuming. That’s exactly what I enjoy about it, so much time and effort goes into a piece and you appreciate it more. When people commission a piece from you it’s a whole process where you work with them to make something that you both love and that will last. The people I know who work with wood are always in the shop and they are so dedicated to what they do. You need to have that drive because it does consume you, you’re always thinking about it. Where we left off: We drew a full scale model of the planter and calculated the angles at which the 10 pieces will fit together (math!). We also milled the wood so that we would have smooth planks to cut the pieces out of. Next! We take the planks and use a table saw to rip them (cut along the grain) to the width the planter pieces will be. My first time using a table saw. Look at how my pinky finger's trying to separate from the rest of my hand. Next up we rip the angles (which we calculated earlier) into the wooden planks, by tilting the saw head on the table saw to the desired angle. Now we have a bunch of planks cut to the right width and angle. Time for a test to see if the pieces will actually fit together. We take one plank and cut it into ten small pieces and roll it up! Since everything's look good, we go ahead and cut the pieces to length with the table saw. Then we cut a dado, or groove, into each of the ten planter sides. The planter base will rest in the dado. Time to make the base! We make a template of the planter base, taking into consideration the depth of the dado. Then we trace it onto a piece of plywood, which then gets cut out with a bandsaw. What a nice decagon (thanks geometry class!). Now that we have all the pieces, we can finally begin putting it all together. First we tape the outer surface of the planter sides together, so that all the sides are attached to each other in a line. Then we dampen the inner surface with a sponge. Wood has a tendency to become a bit rougher after it gets wet for the first time, because the grain raises with moisture. So, we want to prevent it from getting rough later by dampening it now and then sanding it smooth. After the inner surface has dried, it's time for the roll-up! We put wood glue between the long side of each planter side, insert the base into the dado of the first piece and start to roll the whole thing up! Now we're ready to add a bevel to the top and bottom of the planter, for extra fanciness. We go back to the table saw, set it up to cut the planter at just the right angle, and then guide each side through, rolling the planter as you go. Left: Bevelling each planter side on the top & bottom Right: The planter in all its beveled glory! Time for sanding! We use an orbital sander to sand the outside of the planter and sandpaper on the inside. FINAL STEP! Add a layer of hard wax oil finish. And there you have it folks! Proof that even a hamster-pawed, machine-phobic, clumsy novice like myself can, through the careful guidance of Junction Workshop's patient and lovely instructors, create a beautiful 10-sided flower planter. I'll never get tired of telling people, "I made that." Sign up for the planter class and others here. In which I revisit middle school geometry, design and draw a full-scale model, and learn that milling rough lumber takes FIVE different machines. For my first project, Carey wanted to test run the new 10-sided willow planter course. When she told me I immediately thought: "10 sides is too many sides." How does one cut 10 pieces of wood so precisely that they fit together to form a perfect geometric plant home? I will tell you how, because spoiler alert - I did it and you can too! Where all my woodworking adventures take place. It is bright. It is airy. Sometimes there are dogs. There is always the scent of sawdust in the air. I'm proud to say that by the end of the project, I reached an acceptable level of competency on nearly all machines in the photo above (and some that aren't!). Step 1: I am reacquainted with the compass and introduced to the cast iron protractor head (essentially a protractor fitted with a ruler that lets you draw straight lines at precise angles). We start drawing the full-scale model on a piece of particle board after deciding on the circumference of our planter. Step 2: We do math (!) to figure out the angles for the 10 sides of the planter as well as the width of the pieces. Not pictured - my attempting to do math face while Carey actually does all the math. This alchemy is called milling, the process of creating smooth wooden planks from raw lumber, and it requires no fewer than 5 different machines. 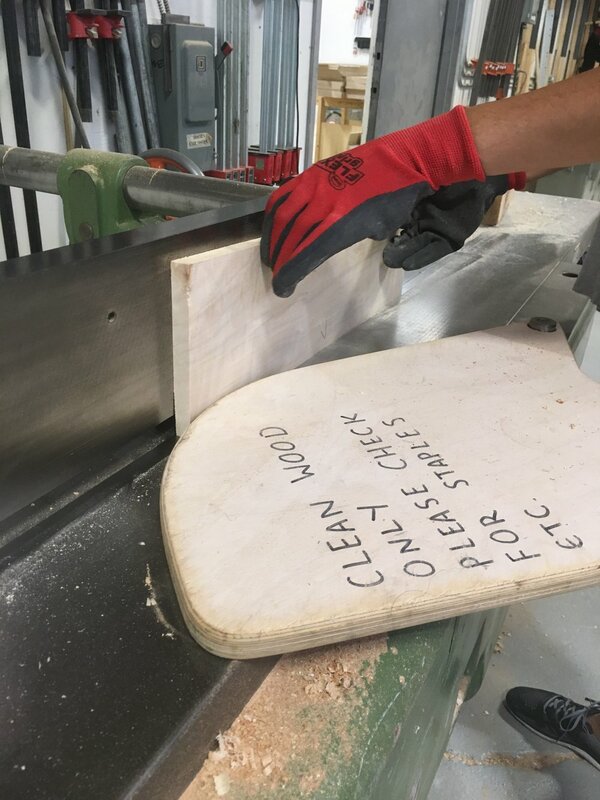 First the band saw and radial arm saw are used to do a rough rip (cut along the grain) and cross cut (across the grain) of the board. Then the jointer is used to flatten one face of the board and give one side a 90 degree angle to that face. A planer is used to flatten the other side. Finally, a thickness sander is used to get the board to the right thickness and to make it extra smoooooth. Stay tuned for pt. 2, where we cut the planks into actual planter pieces and start putting things together! The last part is very satisfying. You really won't want to miss it. Sign up for the willow planter course here. Carey talking about wood grain and movement in the step stool class. Carey Jernigan, one of the founders of the Junction Workshop, came to woodworking from an unexpected place: environmental sciences. While pursuing an academic career in ecology in Halifax she took some time away to re-evaluate and found herself turning towards art. She discovered that art was a way to look at life in a different way and started making things, sometimes with wood. Something about the contrasting demands of woodworking, how it requires both strength and care, appealed to Carey. When she moved to Toronto she found herself peering into the wood shops in the west end and eventually started going into the shops and inquiring if anyone would hire someone without experience. It was then that she met Heidi who took a risk and took her on as an apprentice. That was five years ago and now Carey is a talented woodworker and furniture maker in her own right. I spoke to Carey about what she loves about woodworking, her passion for sharing her craft with others, and her favourite piece. Do you think your initial interest in environmental sciences informs your woodworking? I definitely think so. It made me relate to objects as things that ideally should be lasting. Wooden furniture is one of those things. If made well it can really serve a purpose for a long time. In environment sciences, you see this kind of disposable culture and get quite concerned about fossil fuels and plastics, for me the history of woodworking and the longevity of wooden things were a kind of comfort. What do you like most about woodworking? Compared to other things I’ve done, it’s been the one that in the moment has been the most selfishly pleasurable. I like the mix of the physical challenge of it, a sweaty work day is good for the soul, and the mental challenge, things have to fit just right, so there’s a lot of thinking and planning behind each piece. What’s interesting about working on Heidi’s furniture designs is that we spend a lot of time working on things that are buried within and invisible. There’s a lot in the work that you don’t see. The idea behind all of those steps is that they carry through into the final object in ways that the client might not see, but might “feel”: a sort of visceral sense of the object being carefully made. Some of it is also structural. If you do things a certain way it’s just going to last. What inspired you to start Junction Workshop? How does it feel to go from learning woodworking from Heidi to teaching it? As someone who learned woodworking fairly recently, I still feel close to that thrilling moment when you suddenly see the world as full of things that somebody made. When I started Junction Workshop the joy and empowerment of suddenly being able to make the things that I saw around me or understand how they were made was still fresh. Teaching has really been a way of sharing that joy with others. It is so much fun for me to see other people discover the pleasures of woodworking for the first time. Junction Workshop has also been a way for me to share this world that I had gotten into with friends and a broader community. There’s also a reverse sharing that happens in these classes too, especially in the longer courses, you have time to chat while you’re working and suddenly you’re talking to a software developer, or an academic, or a lawyer. It’s interesting for us to get a peek at other people’s lives too. My favourite piece with Heidi was the Hathaway dresser, which she probably got me attached to by letting me name it. It’s a 12 drawer dresser that I made near the end of my time with Heidi. It looks simple but it had so many pieces that had to go together just right – there was a lot of intricate joinery on the inside and outside. I made the dresser near the end of the five years that we were working together, so it was really a culmination of everything that I had learned. Heidi Earnshaw, one of the founders of Junction Workshop, works by day as one of Canada’s most celebrated and prolific furniture makers. You’ll find her pieces in the Canadian High Commission in London, but also in the cozy living room of your friend with impeccable taste. Her designs are modern, with clean lines and a simple aesthetic. The character and the warmth of the pieces lie in the details: an elegant dovetail joint, the subtle shaping on a leg, or the way everything seems to sit at just the right height. Heidi keeps one foot in history and another in the present. While her designs are notably modern, she is inspired by tradition. Many of her designs nod to historical detailing, but pare it down to its basic elements. She also does all her technical drawings by hand. You can often find her drawing precise lines in soft pencil with the help of stainless steel rulers in cast iron protractor heads. Doing things the traditional way is time-consuming. She often spends over a month on one item, gradually building the piece from an idea to an object that can be passed down for generations. As she painstakingly puts her pieces together one careful step at a time, her dog Loup stands sentry over the workshop, greeting visitors with sawdust speckling her dense fur. 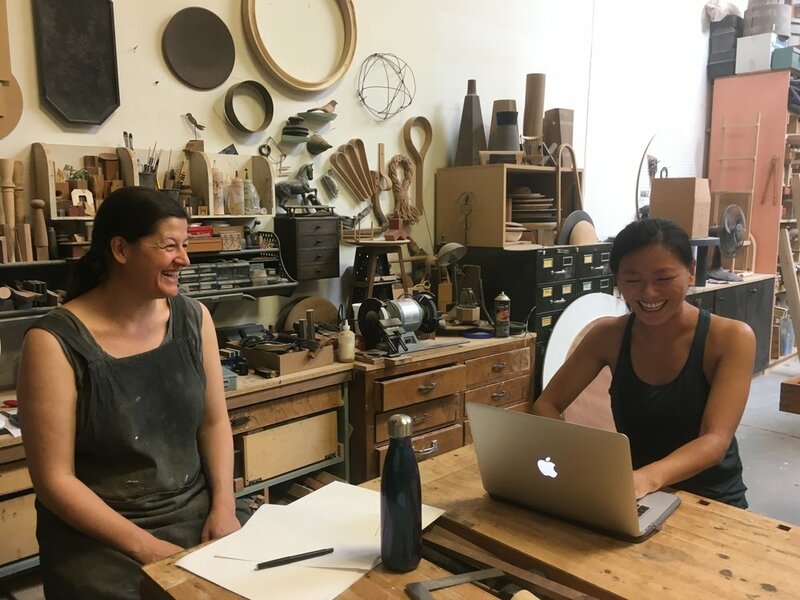 I talked to Heidi about her passion for woodworking, her hopes for Junction Workshop, and why she thinks more and more people are getting interested in woodworking. What do you love about woodworking? I love working with my hands and the mental focus that woodworking requires. I’m a detailed person and I like that woodworking requires a lot of careful attention and deliberate actions. I also love being in the studio, in comfortable clothes covered in sawdust, surrounded by other artists and woodworkers. Woodworking is in some ways a lifestyle as well as a job. You join a close community and you have to work hard and work long hours. What do you find most challenging about woodworking? Being a woodworker means being a small business owner. We don’t just come in and start working with tools and wood. There’s a lot more administration than people think and it can be hard to escape sitting in front of a computer. From managing clients, to design work, to banking, to bookkeeping, to talking to suppliers and getting materials in, all of that is done in front of a screen. That’s the stuff I find most difficult. Why do you think there’s so much enthusiasm for these courses? I think it’s because people crave doing something tangible in real time. I think what’s appealing is that it’s connected back to something, that it’s part of long tradition. There is history in the way 2 pieces of wood are joined together. These skills and methods were developed collectively by humans over thousands of years. It’s powerful to realize that you’re working with the same techniques and that those techniques are still valuable. What are your aspirations for Junction Workshop? In the immediate future we are preparing for new classes in the fall but in addition to that I hope we’ll do more community based work. It is our goal that we can offer classes to people who would otherwise not be able to afford them. We’d also be interested in engaging in projects where we build something collectively that goes to a community centre or social service agency - projects that can serve the needs of marginalized communities. More than anything we hope to keep Junction Workshop going so that more people can continue to have exposure to this traditional way of working and to the pleasures of making things. It really is energizing and inspiring to teach students who are so wholeheartedly interested in the process and amazed by what they are able to accomplish with their own hands. With rising rents, light-industrial spaces that can accommodate workshops like ours are disappearing in Toronto. Several studios in the building next to ours just closed, unmooring artists who have been there for years. There is so much value in keeping these creative and productive studios in the city, where we are accessible to the wider community. Hi! I’m Jiajia. Most days I work in communications at a non-profit based in Toronto. I write press releases, get tangled in hashtags, and generally don’t stray very far from my laptop. When my friend Carey, one of Junction Workshop’s founders, proposed a skill share where I support communications at Junction and in return get some one on one training in woodworking, I jumped at the opportunity. Heidi and Jiajia (right) laughing it up during an interview. I love working in communications, every day is different and things move fast, but like lots of office workers I miss the feeling of creating something that I can hold in my hands. A lot of what I do is fleeting and abstract, tucked in digital folders suspended in an amorphous “cloud”. Words have always been my medium of choice, not wood. But I was drawn to woodworking and Junction Workshop precisely because it’s completely different from what I’m used to. I’ve never really worked with my hands and I’m curious how I’ll navigate a space full of loud machines, fast moving blades, and rough planks of wood. Will I emerge, triumphant, from a cloud of sawdust? Maybe? Maybe not. So, for the next few months I’ll be familiarizing myself with all aspects of woodworking, from drawing up designs and milling wood (the process of creating smooth wood planks from raw lumber), to sanding and finishing. At the same time, I’m going to get to know the Junction Workshop community and meet the people who make it so special. I’ll be sharing my experience through this blog, so check back frequently for interviews, photo essays, and articles on Junction workshop and follow me as I explore woodworking one sliver at a time.